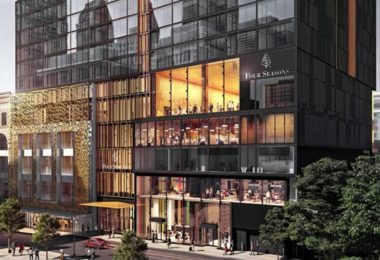 The gal has waited with anticipation to see the stunning new Murray in Hong Kong (sadly ‘long-anticipated’ is a term that has been over-used by too many PR people in today’s hospitality world, but in this case it is true). Ever since the 25-floor, open-square building was designed by Ron Phillips in 1969 some must have thought it would make an excellent hotel. Finally, on January 15th, 2018, the Cotton Tree Drive building opened as The Murray, a Niccolo Hotel, Hong Kong – and the first visitors, amazingly, were Ron Phillips and his family. They were welcome by the hotel’s MD, Duncan Palmer, and his Manager, Dean Dimitriou – whose office, interestingly, is behind a bevelled-glass wall at one end of the long reception area. There are many notable features about the transformation of what for nearly 50 years were Government offices into today’s hotel. The ground entrance floor, a marble haven, is sideways-long and forward-compact, with no comfortable seating. Four alcoves offer private areas for stand-up check-in and check-out. Another, larger, alcove leads back into Murray Lane bar. Everything is sleek and clean, without undue fuss – this is not a hotel for addicts of frills and non-necessities. It seems as if Duncan Palmer has put his own cultured stamp throughout. See the video below of The Murray Suite, with a full kitchen highlighted by an orange Smeg, and a glass-walled gym specifically to hold a Ciclotte, and books on such subjects as Socks: The Rule Book. Rather than a spa manager, here the hotel has a Director of Nutrition and Wellness, Josephine Chan, who will do personalised programmes as required (I merely worked out in the 24/7 Technogym). I loved dining up in Popinjoys, up on the 26th floor, reached by a dedicated elevator from the hotel’s top floor. This is an indoor-out area, and many really enjoy a cocktail out on the terrace. The entire bar area of the L-shaped bar-restaurant is mixologists’ heaven – see a video below – and it was tempting to try an above the clouds, namely Zacapa 23-Year rum, caramelized sugar, applewood smoke, and cassia-infused Angostura.